We are pleased to announce Danny Brown’s move to outside sales for Farmers Coop. Danny is originally from Greenwood Arkansas but has lived in Branch Arkansas for the last 20 years. Danny and his wife Annette, who teaches at County Line Schools, have 4 children, 2 grandchildren and another grandchild due in November. Danny enjoys spending his spare time with family and raising cattle & horses on the family farm. 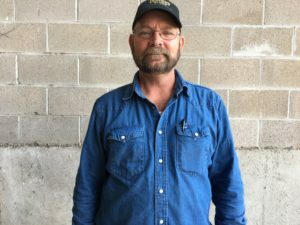 Danny has worked for Farmers Coop for 25+ years and during his tenure, he has worked in many different departments and locations within the Coop. Having someone of Danny’s caliber to represent the Coop on the farm is exciting for us. Contact Danny at 479.629.8837 for all your feed and equipment needs. This entry was posted on Monday, September 25th, 2017 at 1:40 pm	and is filed under News & Updates, Uncategorized. You can follow any responses to this entry through the RSS 2.0 feed. Both comments and pings are currently closed.